It's a pretty cool genesis fps, but you'd have to find some way to rip the sprites and textures from the game, and it would be difficult to reproduce all of the effects it has with the wolf engine, but it'd be neat to see someone do something new with it. 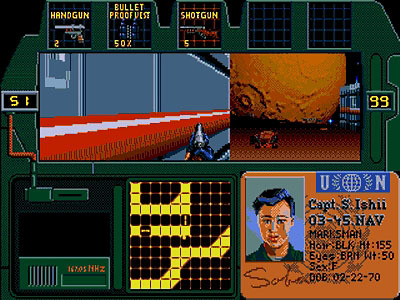 There was also a sequel, and another fps game for the genesis called bloodshot which uses a similar engine. Hmmm... interesting!! Ringman, how bout we make a mod together of this?? Wanna give it a go?? we could use a few more people too!! Mappers, coders, etc. I have a Genesis emulator on my computer and found the ROM for this, pretty good game. The sequel is called Beyond Zero Tolerance, but that was only a beta. The good news is that both games are in the public domain. You can get them both at www.zophar.net. Or you could figure out how to use the tile editors built for genesis roms and get the art that way instead, but they are hard to use, because the tiles of a sprite are usually in small pieces, you have to hunt through the file and get all of them and then put them together. There might be an easier way to use the tile ediotors, but that's all I know. At least you can put most emulators in slow motion so if you did the screenshot grab, you could do it one at a time with less trouble, but it would be way harder than what monk did, because he used a program that could veiw all of the sprites. At least you could use that gun sprite, which is pretty cool.